Hand-numbered, limited-release Chinese style seasoning. Of course, not everyone can day trip to the heart of China. That’s where our delicious Peking spice mixture comes in, giving you the option to bring these imperial tastes home to your dining room, outdoor kitchen or picnic table. Make your own Peking duck, fresh from the oven and steaming with pungent garlic, paprika, turmeric, orange peel and Chinese spices. Or infuse that delicious Asian flavor into wherever your creative spirit takes you. Typically, people are confined to Chinese five spice powder for their Asian recipes, but these powders are often overpowering and detracts from the exquisite natural flavors of duck or baby back ribs. Instead of burying those flavors in spices and condiments, you need a seasoning that will instead complement them, bringing out the best of the meat’s natural taste. 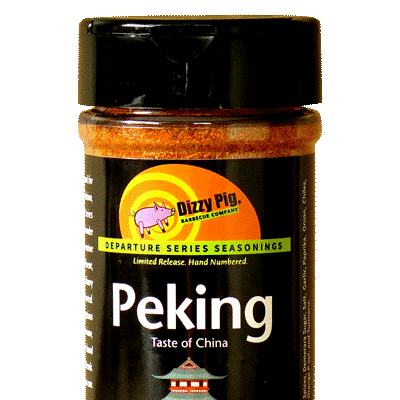 Our Peking blend is balanced to give you the pleasant, authentic taste of Chinese cuisine. Our spice blends are all-natural, gluten-free, made with no peanuts, tree nuts or soy, so you can cook without worry of offending the dietarily sensitive. Try Peking today. We’re confident you’ll discover what so many others have: You don’t have to trek to the Great Wall to bring that delicious Far East flavor into your own kitchen. We’ve had tasty results on pork ribs, chicken, sea bass, vegetable stir fry, shrimp, in a filling for dumplings, and of course duck! Like good Char Siu without all the work! DP new Peking rub knocked our SOCKS OFF!! !